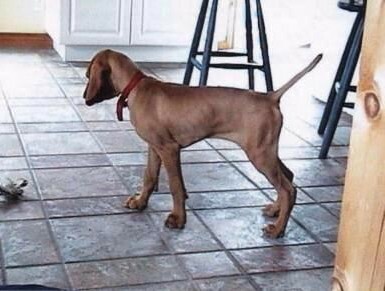 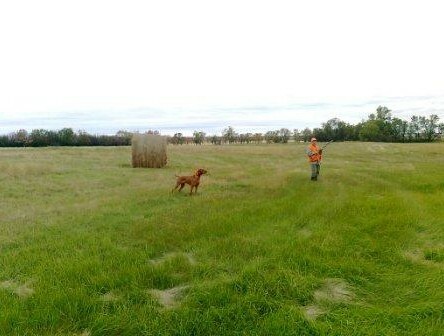 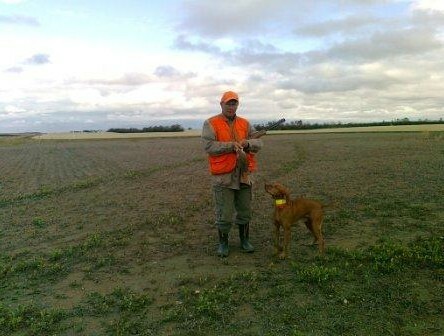 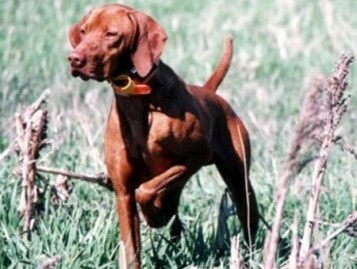 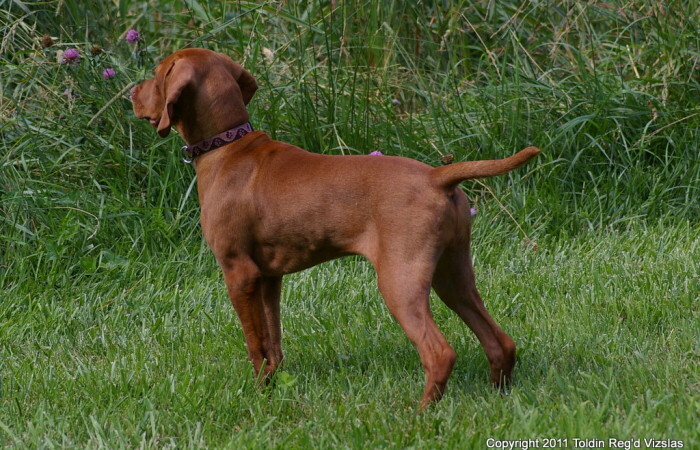 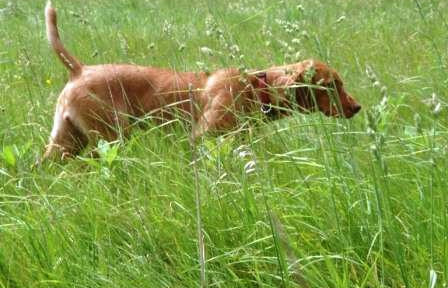 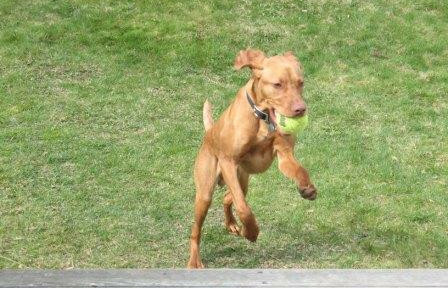 Vizsla dogs are ideal to train for hunting. 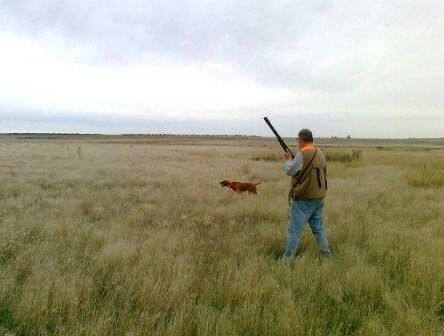 This slider below is of a collection of pictures showing of their skill in the field. 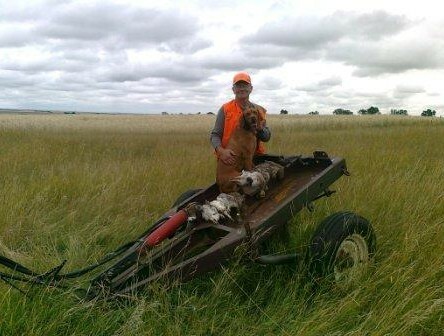 Ray recently took a hunting trip out West, along with his good friends Ripper and Handsome Man. 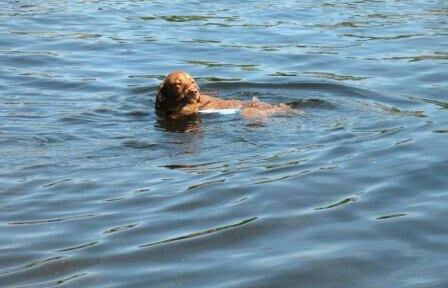 The dogs did not disappoint. 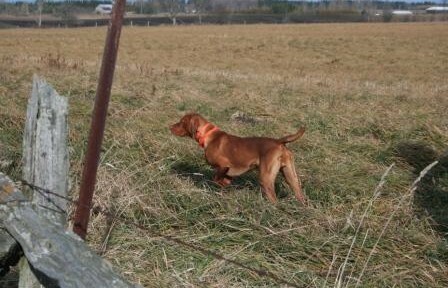 See Handsome pointing at Sharptail Grouse and Bruno getting ready to fire. 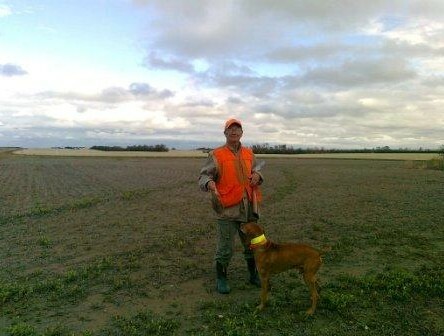 Ripper and Ray ready for a flurry of Hungarian Partridge pointed by a Hungarian dog. 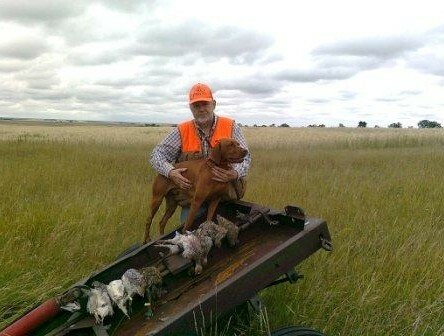 But the gun is Spanish. 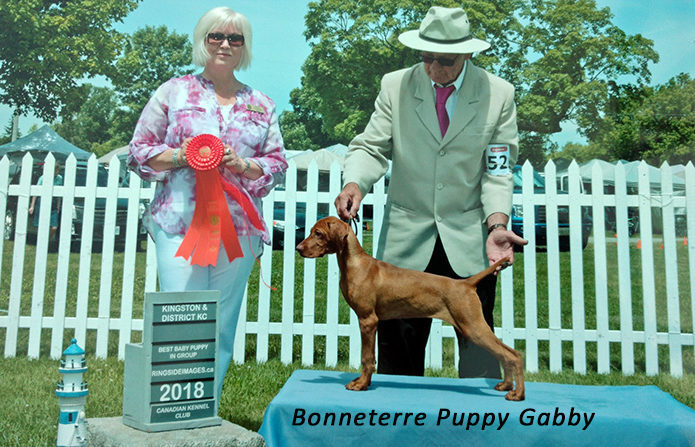 Congratulations to Bonneterre Blazu Nova for earning his FDJ title on September 12, 2010 with scores of 92/100 and 97/100. 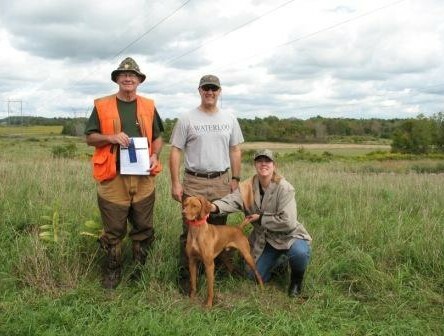 Nova with his owner Julie, Ray, and the field test judge. 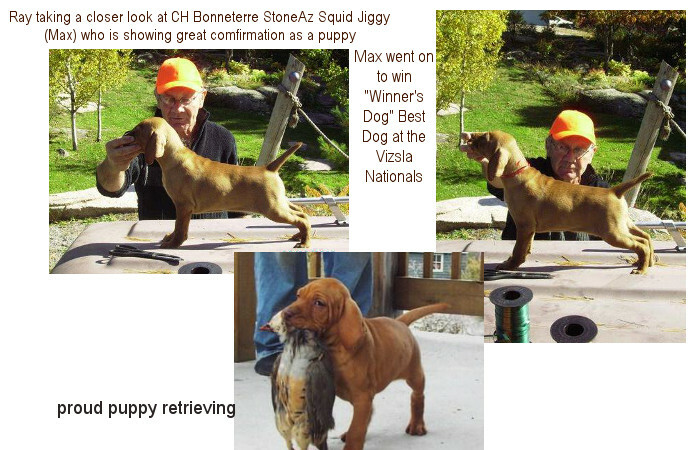 Littermates Bonneterre Blazu Nova and Bonneterre Blazu Xander performed well in their NAVHDA debuts in August 2010. 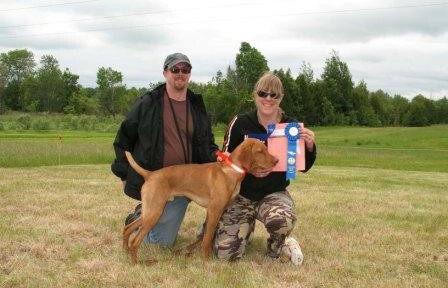 Xander scored 102 for a Prize II while Nova continued to show his exceptional ability in the field scoring a PERFECT 112 score for a Prize I. 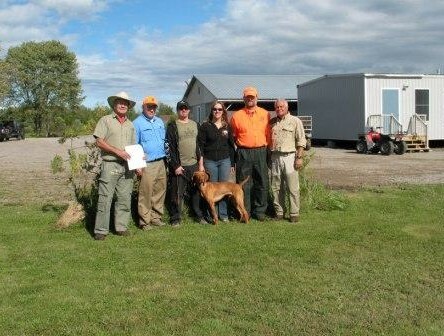 This is a pictured of Nova with his owners Julie and Chris, Ray, and the NAVHDA judges. 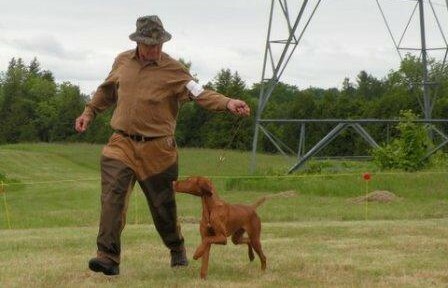 Here is a shot of Toldi, Ripper's father (and Aszu's grandfather) showing a tremendous point in the field. 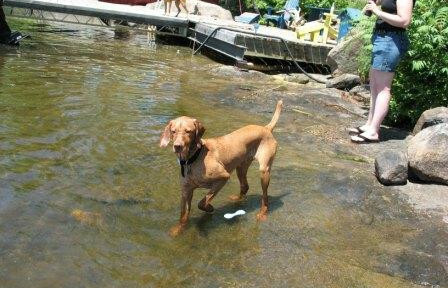 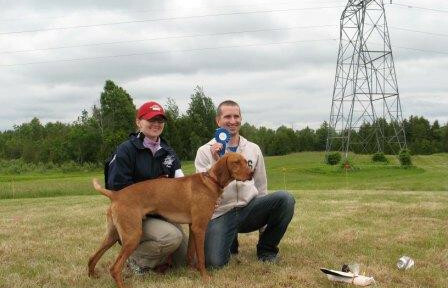 Here is Bonneterre Tuckamore showing natural pointing instinct which the judges saw in 2005 awarding him #1 Vizsla in Canada with a qualifying score of 96.3%. 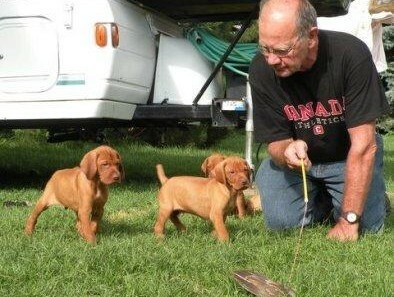 What have our puppies gone on to do? 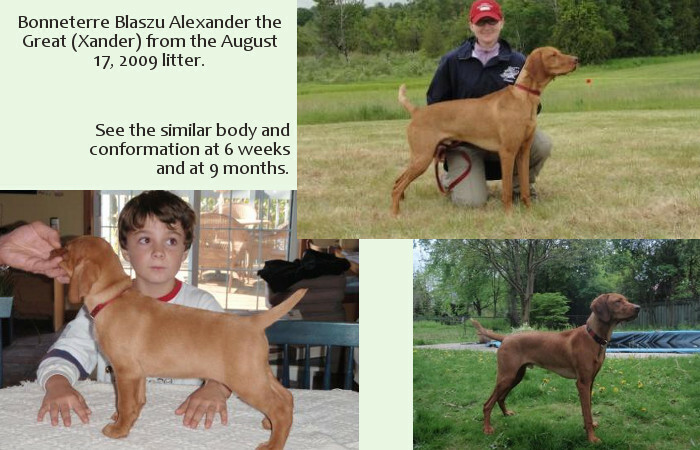 Below are various Bonneterre vizslas that have achieved a number of accomplishment in the field and as a fine companion.